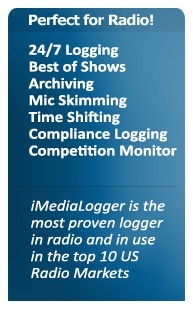 When introduced in 1999, iMediaLogger set a new standard in software based audio logging, archiving, skimming and storage – and is still setting the standard. iMediaLogger – Proven, Flexible, Powerful. win-OMT's iMediaLogger is deployed across a very broad base of clients of all sizes and formats. iMediaLogger can be employed at any location since it seamlessly integrates with both iMediaTouch and all other automation systems. iMediaLogger works easily and efficiently with tuner cards, switchers, satellite receivers, external closure devices and silence alarms. win-OMT's latest iMediaLogger Version 6 is built on decades of experience, client input and win-OMT's continued commitment to product investment.